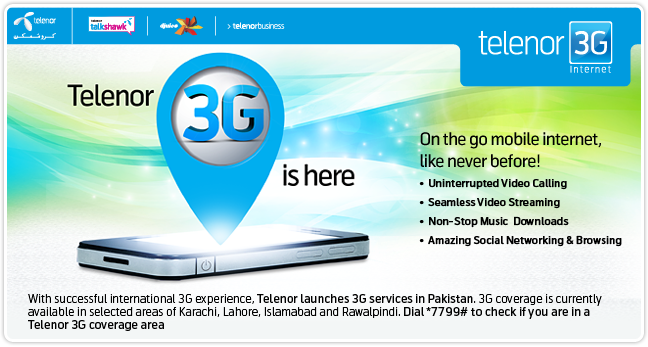 Telenor Pakistan has become the second 3G operator in Pakistan to commercially launches its 3G services on Friday, 30-May-2014. On the same day of commercial launch of 3G service, Telenor Pakistan announces its 3G Packages and 3G Bundles for both prepaid (including Talkshawk & Djuice) and postpaid customers. Telenor 3G Packages are valid on all prepaid price plans from 1st June, 2014. Default rate, Usage without subscribing to bundles will be charged at 10 Paisa per 10 KB. After Rs. 50 of daily charging on default rate further usage will be completely free for the rest of the day. Additional usage after bundles are consumed will be charged at 1 Paisa per 10 KB (valid till bundle end date). 3G bundles will work both on 2G and 3G and 2G bundles will not work on Telenor 3G. Default rate, usage without subscribing to bundles will be charged at 10 Paisa per 10 KB. Additional usage after bundles are consumed will be charged at 5 Paisa per 10 KB (valid till bundle end date). These bundles are valid on Telenor Professional Smart Plans only. Dial *7799# to check for 3G coverage in your area. Same Mobile Internet Settings will work for both 2G and 3G Access.